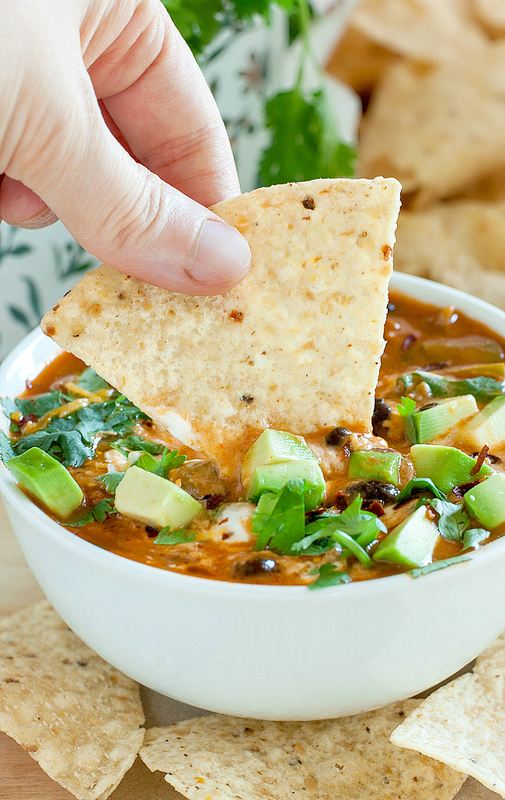 Prepare to fall in love with this deliciously speedy shortcut taco soup! Today I’m partnering with Pacific Foods to turn one of their uber healthy soups into a hearty and nourishing meal, all while clearing the fridge of leftovers and kicking food waste in the face! BAM! Can you tell I’m excited? I’m SO excited! I’m a huge fan of revamping tasty leftovers into even tastier new dishes. It saves time, saves money, and makes crazy busy days just a little bit easier. There’s really only one rule: No boring leftovers! Of course this soup couldn’t be boring if it tried, especially since it’s a glorified fiesta in a bowl! In fact, it’s the fiesta that never ends! It all starts with taco night. As inevitable as breaking my tacos into a million pieces within the first bite, is the fact that we’re going to have some serious leftovers. I know how much I should cook for two, but honestly if I’m in the kitchen anyways, I might as well make enough for two or three meals, right? It’s a total lifesaver when lunch rolls around the next day and I’m still in stretchy pants and covered in neon pink paint, stickers, and copious amounts of peanut butter. Leftovers to the rescue! Leftovers AND Pacific Foods to the rescue! I’ve been a Pacific Foods junkie for years and seek out their handy little Tetra Pak cartons whenever I’m stocking the pantry. I love that they don’t have the metallic taste of canned soups and the packaging is gloriously sketch and BPA free! Their soups starters, veggie broth, and refried beans have always snagged top billing as my favorite pantry staples. Until now. A few weeks ago I picked up a carton of their Creamy Tomato Soup and basically died of yum. Hello new favorite! It was everything I wanted in a tomato soup and I didn’t have to break out the food processor to get it! Huzzah! Then of course the planets aligned and I got the most exciting offer to partner with the brand. So a mere few weeks after declaring the Creamy Tomato Soup my new favorite, the Roasted Red Pepper and Tomato Soup comes into my life and changes everything. It’s a tomato love triangle guys, I’m obsessed with them both and I don’t care who knows it! Well, maybe don’t tell the soup… That could get awkward. In all seriousness, these soups are flipping amazing. While great all on their own, they’re also the most brilliant base for a fridge full of leftovers. Have you ever saved leftover rice, pasta, meat, or veggies with zero clue what to even do with them? Or maybe you panic and toss them, knowing very well that the back of the fridge is where leftovers go to grow legs and googly eyes… Well I’m totally here to change that! I hereby dub this leftover-rescuing superhero of a soup Taco Night 2.0 and it’s officially what I’ll be doing with all my taco night leftovers from here on out! Nachos were the old go-to (because YUM!) but this soup is a waaaaay healthier option plus I still get to let a few tortilla chips in on the action. Done deal! Bring a pot to medium heat with a quart of red pepper and tomato soup. Add black beans, taco meat, bell peppers, chili powder, garlic powder, cayenne pepper, salt, and pepper and simmer for 15 minutes or so until peppers have softened and the flavors have had a chance to mingle. Give it a taste and add any additional seasoning as desired. I added a little extra cayenne pepper for a kick! The amounts of cumin, chili powder, and garlic powder can all be amped up as desired, the above measurements were my idea of perfecto! Top with all your favorite taco toppings and dig in! It's great right away and fabulous the next day too! Since we're going the super-speedy route for this recipe, the bell peppers will still be firm in this soup. Not a fan of the texture? No worries! You can sauté them in the pot first before adding the soup base for tender bell peppers, skip them, or simmer a little longer to soften the peppers. I love them any which way so you're good to go no matter which approach you take!Recipe yields 4 small servings or 2 big bowls if you're hungry! 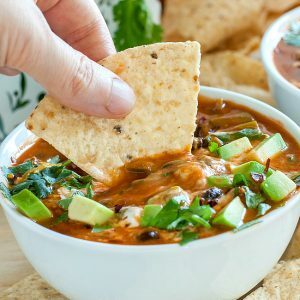 Much like it’s crunchy hand-held counterpart, taco soup is one of those super simple, easily customizable meals that can be made a million and one ways and taste great every time. When there’s a slew of leftovers in the fridge, or we can’t figure out what on earth to eat, this default dish has our back! With so many combinations possible, every night can be taco night! Or in this case, taco soup night! This delicousness is part of my Love Your Leftovers blog series. + lots more to come! Biggest thanks ever to Pacific Foods for sponsoring this recipe and helping me prevent food waste with some leftover love! As always, all opinions and shenanigans are my own doing. I noticed you use a lot of ready-made type of ingredients (like the Pacific soup), can you start maybe posting recipes to REPLACE those because they are filled with sodium and I am trying to cut down on the salt in recipes. Just a consideration for future references. My favorite recipe is the Lentil soup. My coworkers also absolutely LOVE it! three words… Delicious. Delicious. Delicious! They didn’t have to be different words did they? Please keep ‘Love your leftovers’ coming! Bahaha thank you Tara! I’ll take a trio of deliciouses any day! 😉 I’m glad you’re loving the series because I have another installment on the way! Woot! This looks fabulous! I really love soups especially this time of year and especially easy ones. Awesome photos too! Oh my goodness … I never thought to use our taco leftovers to make soup! Totally trying this after our next Taco Tuesday night! I LOVE having a couple of boxed soups lying around to make quick dinners. This shortcut taco soup looks like just what I need for weeknight dinners! It’s so ridiculously satisfying too! I usually need a side dish with soups but this one stole the show all on it’s own! Beautiful soup! Looks bright and full of flavor. Sounds great for busy schedules! 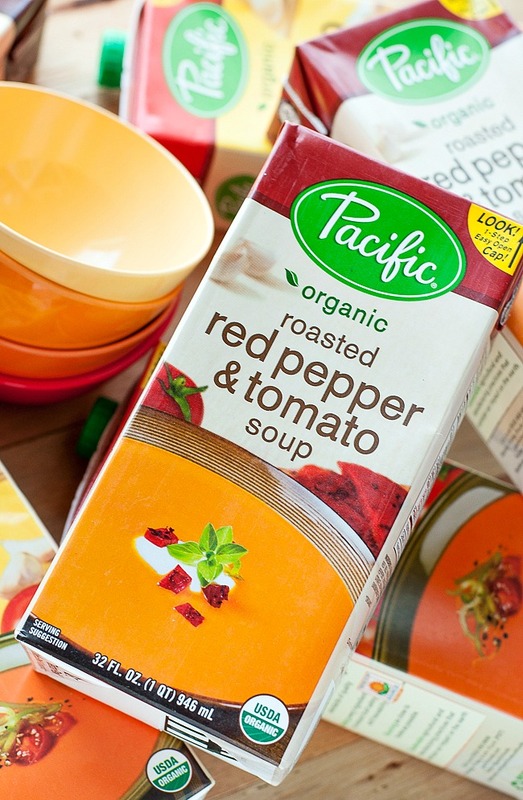 I love the idea of starting this soup with Pacific Red Pepper & Tomato Soup – my favorite! Sounds delicious! Printed, bookmarked, screen shot, and wife forwarded. If it’s easy and cheesy we’re all about it. Looks so yummy and easy to boot! I love taking shortcuts wherever I can and soups are perfect for them. I’m going to bookmark this! We always use our taco leftovers for taco salad or nachos, but now you’ve inspired me to make this taco soup! You are my hero with this amazing soup!! I have to admit, a lot of leftovers go uneaten at my house, but if I can repurpose them into a whole new delicious meal, it’s a huge win! I’ve got that same box of Red Pepper and Tomato Soup in my pantry now, so I foresee your yummy recipe happening SOON! 🙂 Can’t wait! I love revamping leftovers! This soup looks delicious 🙂 So good that maybe I might skip taco night and just have a bowl of this instead!! Haha thanks Dini! I’ll join you! Thanks so much Julia! I always need a few shortcuts on crazy nights! Genius use of packaged soup! 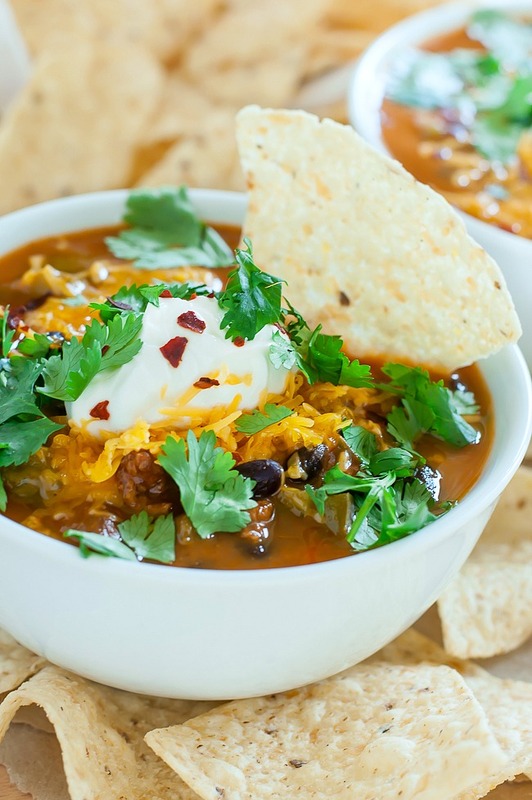 Taco soup is always a hit and this makes it so easy! Oh hello! This is my kind of leftovers dinner idea! And Pacific’s red pepper soup is my fave!! It’s totally my new favorite from them – SO GOOD!!! <3 Thanks Anna! This looks and sounds wonderful! The perfect comfort food! I love using leftovers to make new meals! And we always have these ingredients to make this!! I love a good hearty soup and this Taco Soup is totally calling my name!! Yum! We’re already clamoring to have it again – Hope y’all love it as much as we do!